How to install an SSL certificate (instructions)? 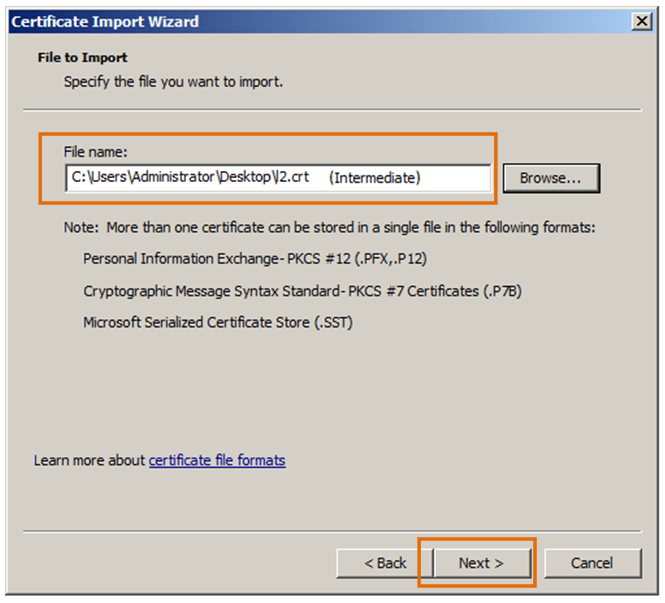 the file containing the intermediate certificates (intermediate/ca-bundle) relevant to the ordered SSL certificate. Place the file on the server which makes your website available, in the relevant directories. the previously generated ssl.key private key needs to be placed in the /etc/ssl/ssl.key directory. Note: Only Apache can have access permission to this directory. The yourDomainName.crt and ca-bundle files should be moved to /etc/ssl/ssl.crt directory. Important: The above paths serve only as examples. Your server may have different ones — some modification may be required. Edit the SSL configuration file for the web server with a text editor. Important: This file location varies depending on the web server configuration. in Apache 2.4 enabling SSLv3 and TLSv1 protocols and optionally TLSv1.1 and TLSv1.2 (in OpenSSL 1.0.1 and higher). in Apache 2.2. a SSLProtocol All -SSLv2. directive should be used. The -SSLv2 parameter disables the obsolete SSLv2 protocol support. SSLCipherSuite ECDH+AESGCM:DH+AESGCM:ECDH+AES256:DH+AES256:ECDH+AES128:DH+AES:ECDH+3DES:DH+3DES:RSA+AESGCM:RSA+AES:RSA+3DES:!aNULL:!MD5:!DSS – setting priority for the strong ciphers while at the same time disabling the weak and obsolete ones. 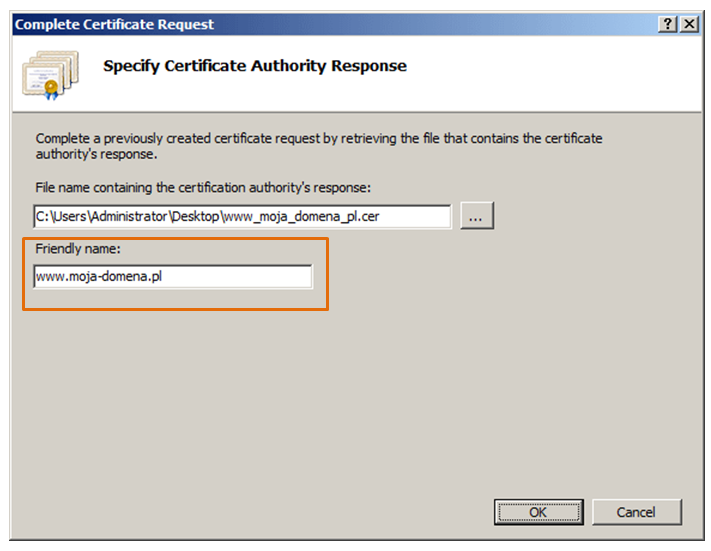 On receipt of an email with the SSL certificate for the server, copy it into any text editor and save the file with the .cer extension (e.g.www_moja_domena.cer). 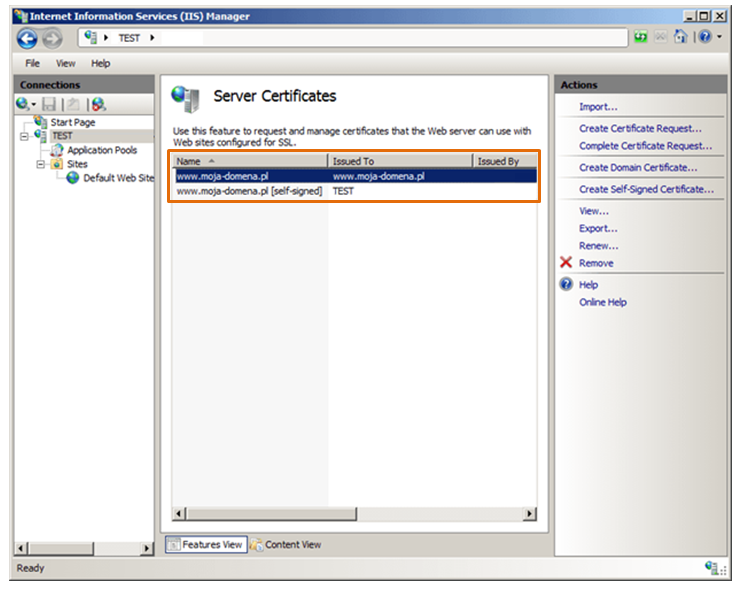 In order to „close” previously generated CSR requests on the IIS and upload the SSL certificate received, go to the Internet Information Services (IIS) Manager, and from the left menu select your server name. 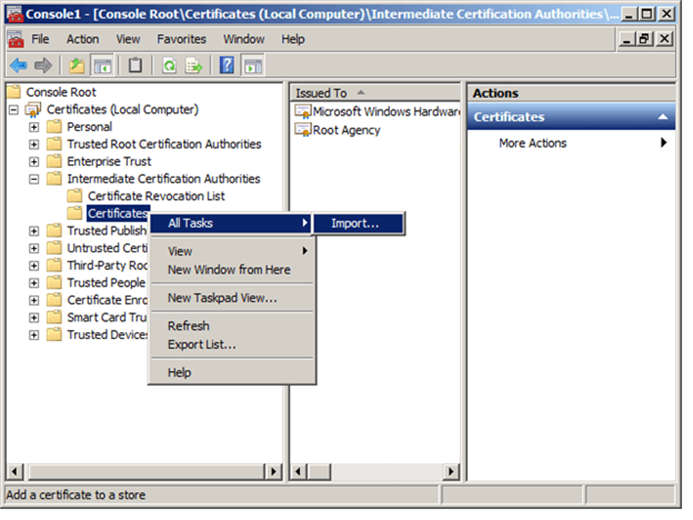 From the centre panel click the Server Certificates icon, then from the Actions right-hand panel select Complete Certificate Request. Select the file that contains the server certificate issued. In the Friendly name: box enter a friendly name for the certificate, which will help you to identify it, e.g. www.moja-domena.pl. Confirm it with the OK button. 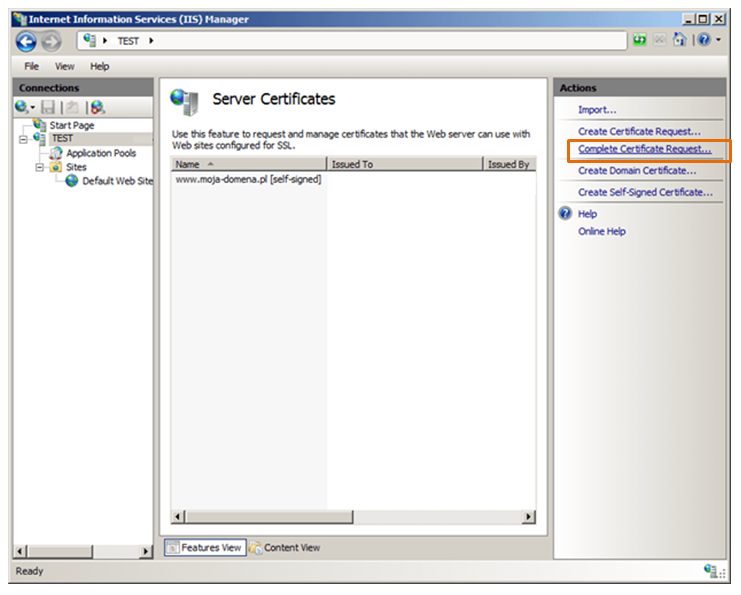 The issued server certificate will be displayed in the Server Certificates centre panel. 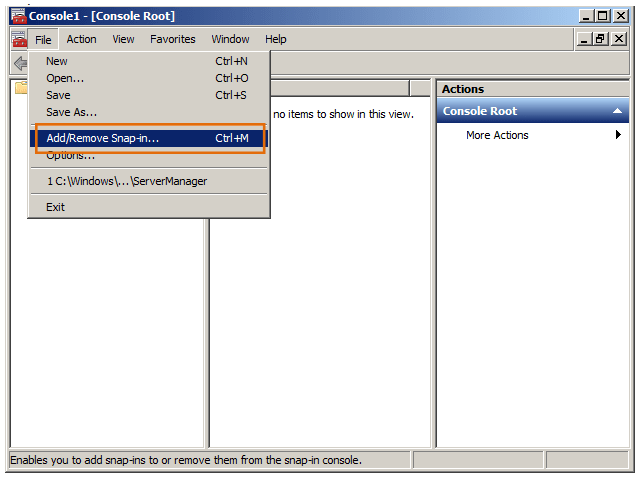 In the Site Bindings window which will be displayed click Add…. 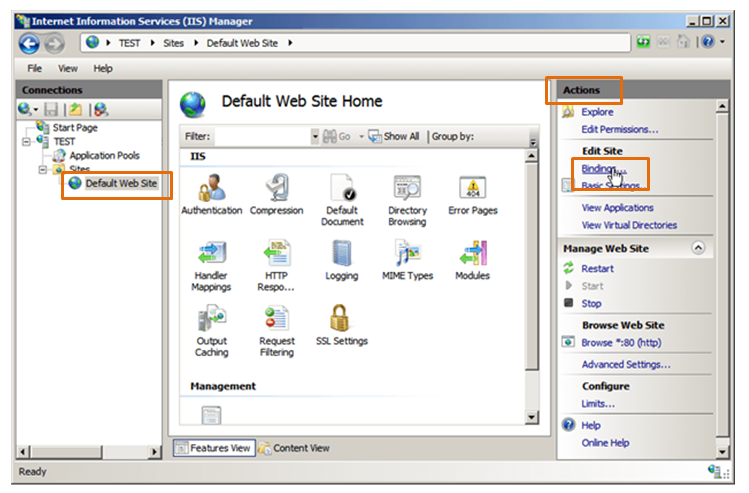 In the Add Site Bindings window from the Type: dropdown list select https, then from the SSL certificate: dropdown list select the certificate which you will use for your website. The list displayed includes certificates with their own private keys. 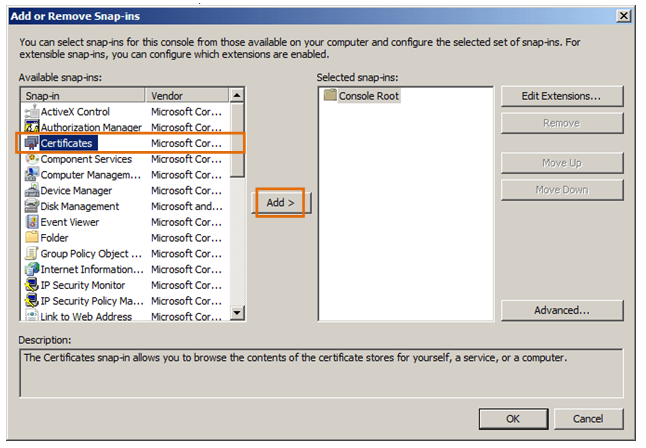 Then, from the list of available snap-ins, select Certificates and click on the Add > button. Select Computer account and click on Next>. Intermediate authority certificates are very important for the SSL certificate to work correctly. They should be installed on the web server, so that the web browser can verify the SSL certificate issuer in the correct manner. Note: Actions described in this manual should be performed only if there are no certificates installed on the Windows 2008/2012 server system. 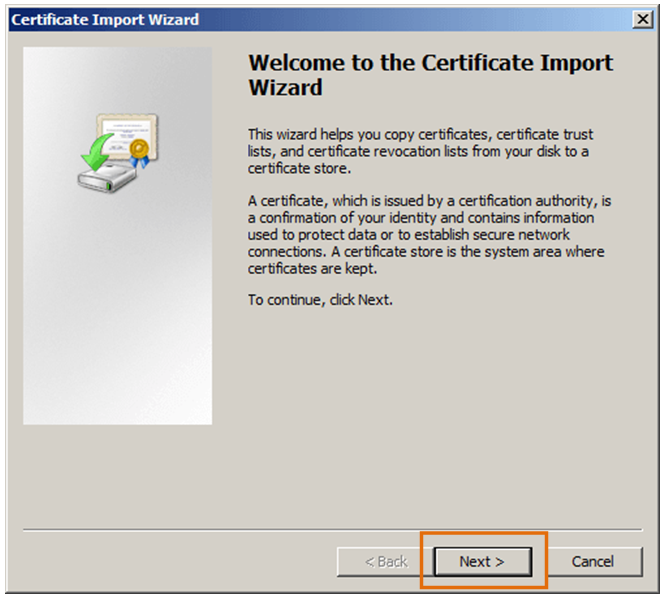 In the Certificate Import Wizard click Next. Select the file with an intermediate certificate and click Next. 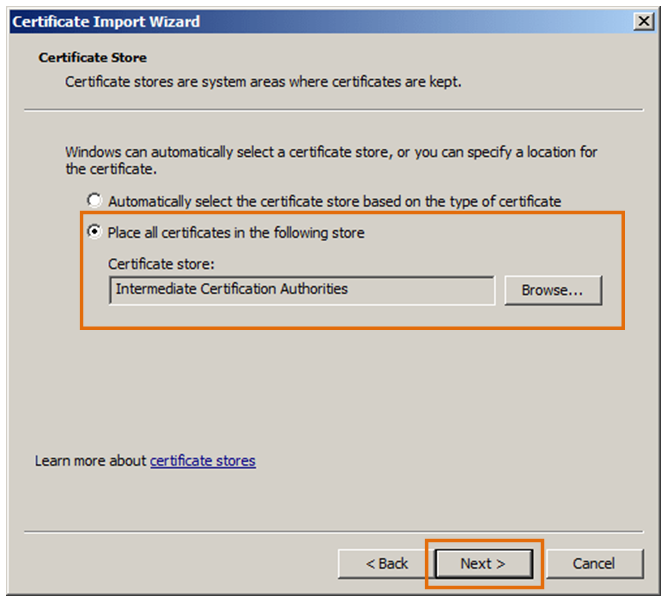 Select a target location where the certificate will be stored. Select Place all certificates in the following store. 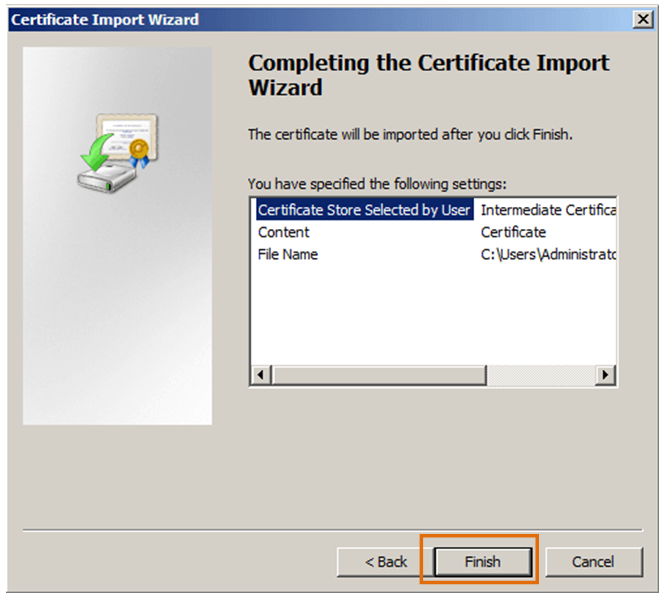 The Certificate store: box should indicate Intermediate Certification Authorities. If you want to install intermediate certificates for certificates of other types, repeat the above steps (from points 2 to 6). 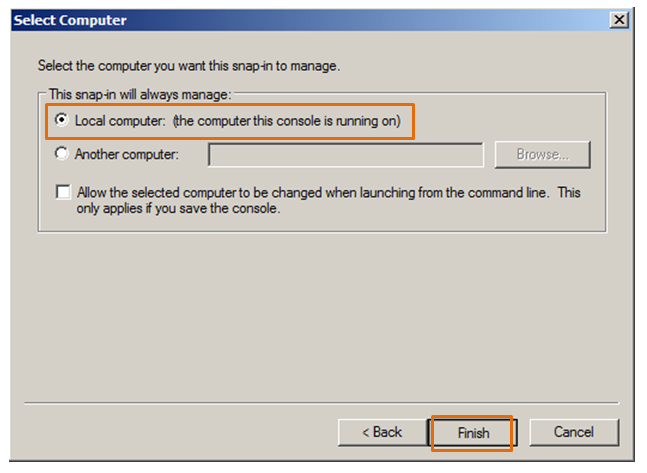 Note: In some cases changes in the IIS configuration may not be visible after the service restart. If this is the case, you should restart the Windows operating system. 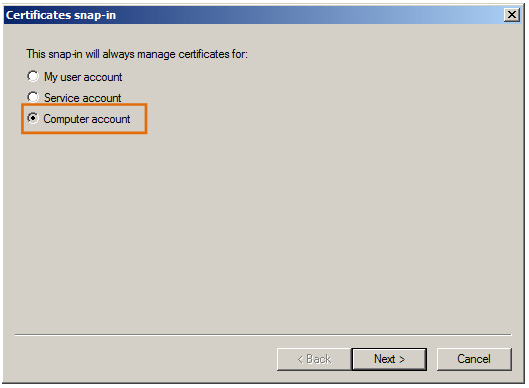 It is a repeated issue of a certificate with the end of validity date of the certificate maintained. A certificate reissued using this mechanism is completely free. The owner of the SSL wants to replace it with a new one for any other reason. Note – important information for users! causes the original SSL certificate to be automatically Revoked by the Certum Certification Authority at least 14 days of the reissue of the certificate. Therefore, we suggest that you install the newly issued SSL certificate on your server instead of the original certificate. At the same time, the newly issued certificate will become the base certificate.